I havent been able to get on here for about 4 days. The reason why? Every time I clicked on WME in the most visited page on Chrome,it would redirect me to an orange and blue (Gulf colors) page that says "This account has been suspended". I dont have a screenshot or link to this page however. I dont think my account was suspended,it must have been something in the system. I tried it on my iPhone and 2 other computers,and got the same page. Did anybody else get this page? Looking at the new posts,they are all from 4 days ago. I am pretty sure that the owner of the website forgot to pay the bills...hence why the account was suspended. It had nothing to do with your browser or computer. Yeah I was thinking the same thing. At first i thought my account got banned. Then I checked my emails and found no notifications about my ban. Then i assumed that the bills hadn't been paid for. Guess we gotta keep the donations going then. This happened to ID Forums too, ofc. Let's be logical here because I don't want more people posting "what they think happened". If we need any explanation as to why WME has been down the past few days, let E86 explain why because he knows more than what any of our members can assume. So until then, you're not required to continue posting in this thread as to why you assume WME went down. 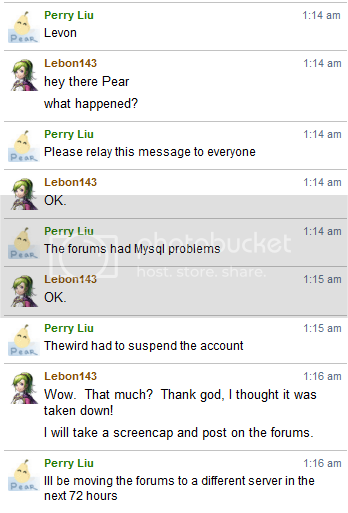 The server this forums is on was having massive MySQL issues. The origin of the problem is still unknown. The server admin had to suspend the server for some time to isolate the problem. It was re-opened yesterday to see if there are any immediate slowdown on the server. It seems though the problem has not occur again. But that's not to say it won't ever happen again. As a result, I am going to have to move this forums and idforums to a new server. Unfortunately, I am currently in China and am not able to initiate the DNS and server transfer process. Until I am back on July 10th, we'll stay on the current server and hope it doesn't happen again in this short period of time. I'll keep you posted until then. Just so we are clear, there is no financial difficulty with the server funding. But you are welcome to donate to us. Thanks! When the you switch to a different server, will the forum layout change, or is that a domain thing? In other words, are we still going to use Invision Power Board? WRX is correct, a server change does not change domain name or layout. The only thing it affects might be the connection speed and loading time. The server we are moving to in July will have faster load time. Thats good to hear. Before this happened,I was having slow loading times. It wasnt my connection because I could access other sites in an instant. yeah occasionally i would get timeouts that could be the server or really anything in between its hard to say i guess.